The Habit introduces an extra dose of spicy flavor with the launch of new Sriracha Lime Spicy Green Beans. 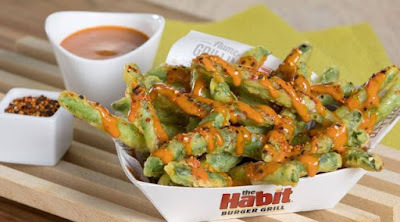 Available for a limited time, the new menu item takes the chain's tempura green beans and drizzles on a house-made sriracha lime aioli and finishes with a sprinkle of 7-Spice pepper blend. An order of Sriracha Lime Spicy Green Beans will run you $3.49. Photo via The Habit Burger Grill.